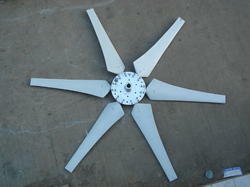 Leading Manufacturer of frp fan from Ahmedabad. FRP Fan offered comes in quality construction finish and feature new generation fan design which makes these fans deliver optimum functional working support. Further, these high performance based cooling tower fans also provide for high savings on energy while delivering superior international quality standards. superior flow characteristic of fan outlet for achieving optimum distribution of air across cooling tower. Looking for FRP Fan ?